Small nibble on foot of one cup underneath not visible from standing on saucer. Royal Doulton - Brambly Hedge - Cup & Saucer - THE ENGAGEMENT & THE WEDDING . Beautiful collectable set. Condition shown in photos as very good. Dispatched with Royal Mail 1st Class. SIGNED FOR. Vintage Royal Doulton Brambly Hedge Autumn Cup and Saucer Bone China 80s VGC UK. Condition is Used. Dispatched with Royal Mail Signed For® 2nd Class. 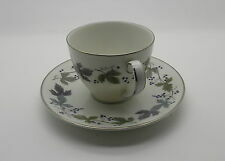 Royal Doulton Caprice Cup and Saucer 1988 ( X 2 ) BRAND NEW. Condition is New. Dispatched with Royal Mail 2nd Class. Box is a bit tatty looking as was stored in my mums loft. From a non smoking home. This auction is for a delightful antique trio of tea cup, saucer and plate from Royal Doulton in their bright green colourway of 'Temple' pattern (E1289) with smooth edge. This lovely Japanesque design includes Temple on stilts, bridge, mountains and Chrysanthemums all hand-enamelled in rose pink, pea green, iron red etc. The trio is in excellent antique condition with no chips, cracks or repairs and with bright, fresh paintwork. I have not found any glaze crazing. 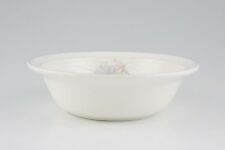 The cup measures 3 3/8 inches (8.5 cm) in diameter and 2 3/8 inches (5.75 cm) high; the saucer has a diameter of about 5 1/2 inches (13.75 cm); the plate has a diameter of 7 inches (17.75 cm). Please also see the other trios we have listed this week. We aim to make postage as economical as we can. Saucers 6". White ground decorated with pale pink chrysanthemum/carnation type flowers and foliage and edged with gold gilding. 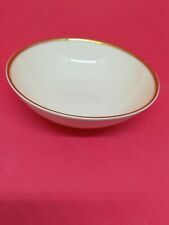 Royal Doulton Berkshire TC1021 Tea Saucer. Collection (if required) is Bath. The cup stands approx. 3 1/2" high. 1983 Royal Doulton Jill Barklem Brambly Hedge summer bone china Teacup and Saucer. Condition is New. Dispatched with Royal Mail 2nd Class. This is a lovely example of the Royal Doulton, Bunnykins Series. This delightful cup and saucer are in perfect condition. These pieces was produced between 1940 and 1952. The patterns are all in very good condition and both pieces carry the Barbara Vernon signature. It is in good condition but does have signs of wear and cutlery marks as it has been used. This item has been kindly donated to raise funds for Helen Rollason Cancer Charity Royal Doulton Brambley Hedge Autumn Tea Cup And Saucer Set In Original Box. Box slightly squashed but contents not affected. 6 Beautiful Royal Doulton Berkshire Teacups And Saucers . Condition is Used. Dispatched with Royal Mail 2nd Class. We have 4 sets of 6 available if anyone is looking to purchase extras. Royal Doulton 'Ashmont' H5010 Coffee set. Unused condition, though case shows signs of ageing. Early Royal Doulton Bunnykins Cup and Saucer. 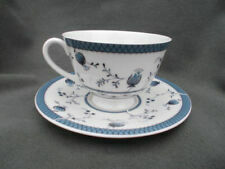 Beatrice Potter English Fine Bone China. Royal Doulton Four Seasons Cup and Saucer. Full Size. pattern on cup is probably not as clear as when new. Saucer is in very good condition. Season "Winter". Royal Doulton Brambly hedge Autumn miniature cup and saucer. Condition is Used. Dispatched with Royal Mail 2nd Class. A beautiful floral design with a gold coloured rim. All in excellent condition. Saucers - 15cm. Bowls - 13cm. Small plates - 17cm. 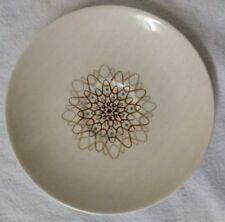 Larger plates - 20cm. A beautiful floral design with a gold coloured rim. All in excellent condition. Saucers - 15cm. Small plates - 17cm. Larger plates - 20cm. Does have a chip on rim see pics Check out my other items I'm happy to combine postage Royal Doulton Frost Pine Gravy Boat & Saucer Dispatched with Royal Mail 2nd Class. Good condition but with under 1cm barely-visible tight hairlines to rim (still ping on tapping). They have had very little use, as shiny as new, gold is very bright and unworn. Superb Royal Doulton Bone China Brambly Hedge Winter Cup & Saucer. Superb Royal Doulton Bone China Brambly Hedge Winter Cup & Saucer. No box but will be well packed. Vgc. No chips or cracks or crazing. Otherwise all are free from scratches and any signs of wear. They are in 'as near-new condition’ as is possible, consistent with their age. This is due to wide-angle photographic distortion on close-up images. Royal Doulton ROSE ELEGANS. A Teacup and Saucer. This is a beautiful fine bone china tea cup & saucer, which was made in England by Royal Doulton in the Clarendon pattern H4993. The bases have the makers mark. Royal Doulton Brambly Hedge miniature cup and saucer. Dispatched with Royal Mail 2nd Class. ROYAL DOULTON SHERBROOKE COFFEE CAN AND SAUCER I have 4 sets - please enquire. Dispatched with Royal Mail 2nd Class. Pattern:Minden - D5334. Manufacturer:Royal Doulton. Item:Tea Saucer. HIGHLY COLLECTABLE, ANTIQUE ROYAL DOULTON HAND PAINTED COFFEE CAN, WITH FLORAL DESIGN, A CHARMING COLLECTABLE ITEM OF ROYAL DOULTON. Royal Doulton TAPESTRY. Teacup and Saucer. A Teacup and Saucer. Royal Doulton TAPESTRY. 4 lovely plates. Used Please see photos for their condition. I have take the photos with and without the flash so you can see their condition. 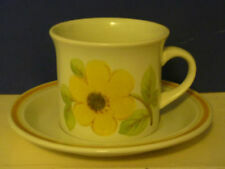 New listingROYAL DOULTON FLORINDA SMALL DEMI TASSE CUPS X 6 AND 8 SAUCERS. Royal Doulton CLARENDON. Teacup and Saucer. Royal Doulton TWILIGHT ROSE Teacup and Saucer. ROYAL DOULTON COFFEE CAN SAUCER 1920`s - EXCELLENT !! RARE ROYAL DOULTON SERIESWARE SAUCER - GNOMES B D4697 - EXCELLENT ! !